Continuous construction of high-rise buildings as well as growing government spending on infrastructure development spurred wide installation of elevators and escalators in UAE. Elevator segment captured major UAE elevator & escalator market share, wherein majority of the market installations were witnessed in the residential, retail, transportation and hospitality sectors. However, escalator segment is projected to grow at a higher CAGR during 2018-24, primarily due to growing installations across airports, metros, and railway development projects in UAE. According to 6Wresearch, UAE Elevator & Escalator Market size is expected to grow at a CAGR of 4.7% during 2018-24. In 2015, the market registered slow growth due to slump in oil prices, which hampered the infrastructural development projects in the country. The market is anticipated to record growth on the back of improving economic conditions in UAE. Growing urbanization rate, and rise in installation of elevators in the residential sector would boost UAE elevator & escalator market forecast revenues. Amongst all the elevators segments, machine room elevators acquired highest revenue share of the market. In UAE, the Northern region held major market for elevator and escalator in terms of volume owing to increasing infrastructure development activities, especially in the commercial and residential verticals. During the forecast period, Eastern and Western regions are expected to register higher growth in the market. The UAE elevator & escalator market report thoroughly covers the market by elevators and escalators types, sub-segments, verticals, and regions. 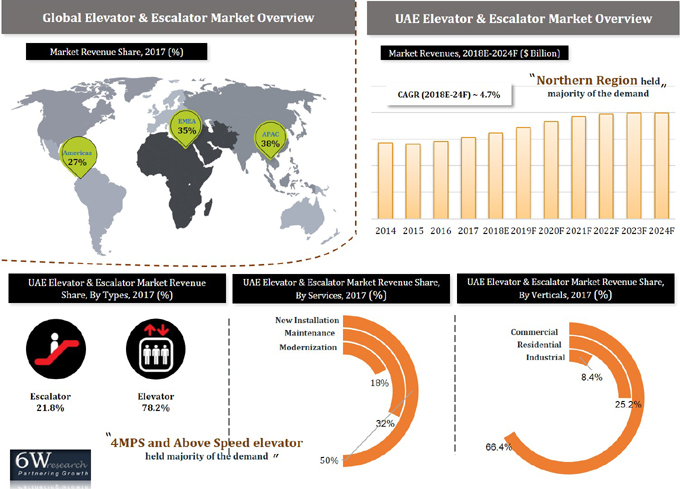 The UAE elevator & escalator market outlook report provides an unbiased and detailed analysis of the on-going UAE elevator & escalator market trends, opportunities/ high growth areas and market drivers which would help the stakeholders to device and align their market strategies according to the current and future market dynamics.